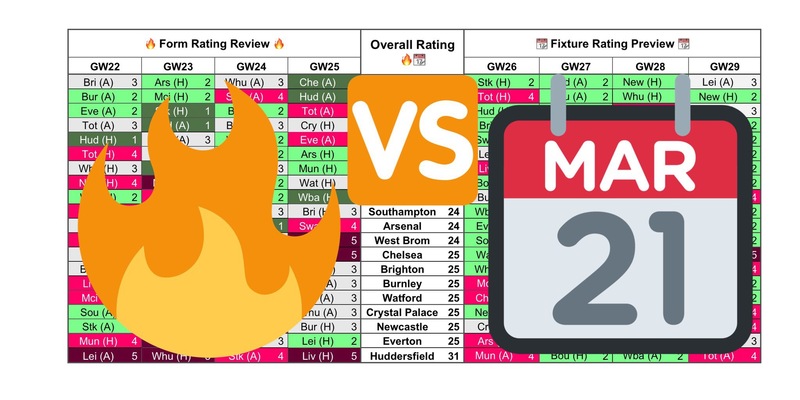 It’s a quick turnaround to Gameweek 26. Which teams have the best balance of form and fixtures? 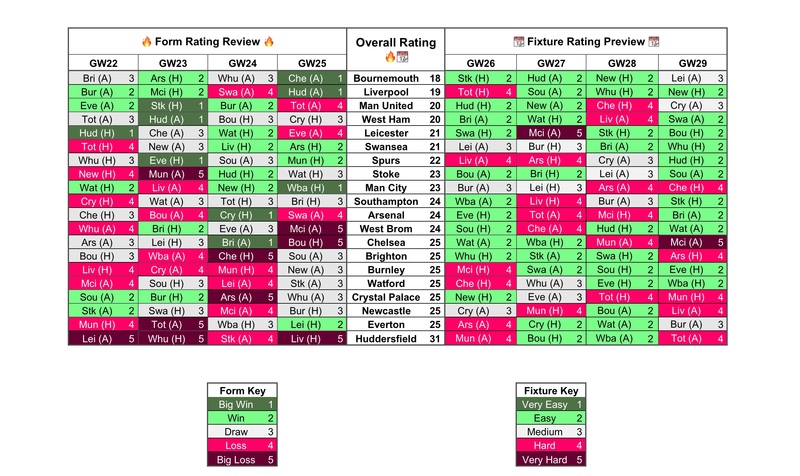 Bournemouth and Liverpool have the best balance of form and fixtures from Gameweek 26 onwards. They’ve both progressed higher up the charts following excellent performances this week. For Bournemouth, Wilson looks to be the standout attacking player. He could be the budget 3rd forward required for you to afford Kane and Aguero. He now has 4 goals and 2 assists across his last six games. Stanislas is also a cheap attacker, if you need a new midfielder. They are both enticing options, but a double up may be overkill here. The Bournemouth defence hadn’t kept a clean sheet since Gameweek 13, prior to their shut out at Stamford Bridge: Ake might be worth a look. For Liverpool, Salah remains essential. Firmino isn’t far behind, with 6 goals in eight. Robertson provides an intriguing option in defence if he can keep his place. Spurs and Manchester United have the best form over the last four games. Spurs are unbeaten ahead of Gameweek 26. There is an argument for owning Eriksen or Alli in addition to Kane: they are both in form and there’s some potential in the fixtures. Manchester United have had some good results other than being outplayed against Spurs. The fixtures are promising, De Gea will continue to get clean sheets. The attacking options are intriguing and may be worth a gamble against Huddersfield. Be careful if you are investing big money. Stoke have managed back to back clean sheets, Bauer is emerging as a budget defender who can play more advanced as a wing back. Shaqiri and Choupo-Moting are both worth a look in attack. West Ham and Swansea have surged up the charts. West Ham aren’t managing clean sheets and have a number of injury concerns in attack. The Ayew brothers could combine in future weeks for Swansea. Mawson is bringing defensive consistency. Who will you transfer in for Gameweek 26?